Used in non-rhotic dialects. Compare uh. Said when hesitating in speech. (informal) To utter the word "er" when hesitating in speech, found almost exclusively in the phrase um and er. He ummed and erred his way through the presentation. The name of the Latin-script letter R.
From Old High German er, from Proto-Germanic *iz. Cognate with German er. 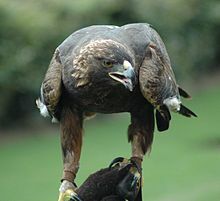 From Proto-Celtic *eriros (“eagle”) (compare Breton erer, Welsh eryr, Old Irish irar), from Proto-Indo-European *h₃érō (“large bird”). IPA(key): /ɛr/, [æɐ̯], but often elided in spontaneous speech. (with a preposition) him, her, it, them. I have worked with it/them. Je kunt er de bergen boven zien. You can see the mountains above it/them. Er is an unstressed variety of hier and daar, used when it is not needed to emphasize the specific location relative to the speaker. With a preposition, er is used instead of hem, haar, het, ze to create a pronominal adverb. See also Category:Dutch pronominal adverbs. From Old Dutch iro, genitive of the personal pronoun (3rd person plural). Mijn broer heeft drie kinderen en ik heb er twee. Ik zie er geen meer. I don't see any more (of them). From Old High German er, from Proto-Germanic *iz. Displaced the northern Old High German forms with h-, e.g. hē, her (see he). Wo ist Klaus? Wo ist er? Where is Klaus? Where is he? Da fuhr die Alte überraſcht auf und ſprach: Lieber Herr, gehe er doch nach Haus und bete er fein und lege er ſich ſchlafen. (personal) it (when the grammatical gender of the object/article/thing/animal etc., being referred to, is masculine (der)). Dies ist mein Hund. Er heißt Waldi. This is my dog. His name is Waldi. Dort steht ein Baum. Er ist über hundert Jahre alt. There stands a tree. It is more than 100 years old. First-person singular indicative present form of vera. Third-person singular indicative present form of vera. Veit einhver hvar pabbi minn er? Does anybody know where my dad is? Maður er sá, er Jón heitir. There is a man who is named John. Konan, er hann var að tala við. The woman to whom he was talking. Þetta er borgin, er hann kom frá. This is the city from which he originated. Bærinn, er hún ætlar til. The town to which she's heading. (archaic) in relations with a demonstrative pronoun (this, that, these) or personal pronoun (I, we, they), which represents the genitive of a relative pronoun. Það er sú bók, er menn þekkja eigi höfund hennar. There is a book whose author people don't know. En er dómarinn andaðist, breyttu þeir að nýju verr en feður þeirra, með því að elta aðra guði til þess að þjóna þeim og falla fram fyrir þeim. Þeir létu eigi af gjörðum sínum né þrjóskubreytni sinni. But when the judge died, the people returned to ways even more corrupt than those of their ancestors, following other gods and serving and worshiping them. They refused to give up their evil practices and stubborn ways. Þá er myndin var búin. When the movie was finished. From Proto-Italic *hēr, from Proto-Indo-European *ǵʰḗr (“hedgehog”) (whence also Ancient Greek χήρ (khḗr, “hedgehog”)), a root noun from *ǵʰer- (“to be excited, be bristly”), whence also Ancient Greek χοῖρος (khoîros, “young pig”) and Albanian derr (“pig”) from *ǵʰór-yos. There is some uncertainty as to the exact forms of this word, especially regarding whether the lemma form of this was ēr or ēris, as the forms attested in literature could point to either option. Another form, irim (acc. sing. ; found in Plautus, Capt. 184), seems to be a spelling variant. The name of the letter R.
Multiple Latin names for the letter R, r have been suggested. The most common is er or a syllabic r, although there is some evidence which also supports, as names for the letter, rē, rrr, ər, rə, and even (in the fourth- or fifth-century first Antinoë papyrus, which gives Greek transliterations of the Latin names of the Roman alphabet’s letters) ιρρε (irrhe). The Latvian name of the Latin script letter R/r. Bøkene er skrivne. ― The books are written. Eg er framand. ― I am a stranger. “vera” in The Nynorsk Dictionary. From Proto-Germanic *airiz, whence also Old English ær. From Proto-Germanic *aiz, akin to Old English ār, Old Norse eir. From Proto-Germanic *iz (“he”), akin to Gothic 𐌹𐍃 (is, “he”), Latin is (“he”). From Old Norse es. The final -s was replaced by -r due to analogy to the plural forms of vera. From Proto-Germanic *aiz, whence also Old English ār. Contraction of earlier eder, from Old Norse yðr, from Proto-Germanic *izwiz, dative/accusative of *jūz, from Proto-Indo-European *yū́. Skulle ni vilja lära er jonglera? Would you guys like to learn how to juggle? See ni for a note on its use as a courteous 2nd person singular. Even though er (2) and its archaic form eder is the possessive pronoun, it does have a genitive form ers and eders, which is only used in expressions like ers majestät (your majesty) and ers höghet (your highness). From Old Turkic er‎ (er), from Proto-Turkic *ẹ̄r (“early”). From Old Turkic er‎ (er), from Proto-Turkic *ēr (“man”). Related to noun-forming suffix -er. Clitic form of hy used before the object or after the verb.